How to Analyze MiniDump Files with BlueScreenView. If your computer crashes, then Windows displays a BSOD screen (Blue Screen Of Death) and at the same time dumps this information (from the memory) to a small file called "MiniDump", that could help you to identify why your computer crashed. On computers that are running Microsoft Windows 2000 or later, a new memory dump file is created each time that a computer crash may occur. The minidump file contains the BSOD error, the Stop Code and its parameters and the module (driver or application) that causes the system to crash. Minidump file is stored under the "C:\Windows\minidump" directory and has a filename such as "062916-2080-01.dmp" which represents the Month/Date and the Year the dump file created. In this tutorial you will find instructions on how you can view and analyze MiniDump files, by using the BlueScreenView tool developed by Nirsof. 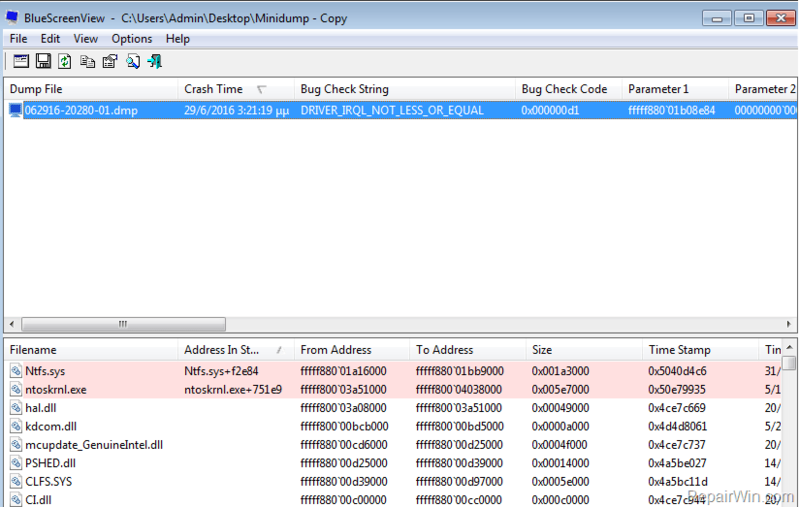 How to View MiniDump files and Identify the BSOD Crash Problem. * Note: BlueScreenView (in Zip file) doesn't require any installation. In order to start using it. 2. Extract the ZIP file you downloaded and then run the "BlueScreenView.exe" application. * Note: If you have changed the Minidump files' default location or you have transferred the minidump files from another computer to yours, then go to Options menu -> Advanced Options and select the alternative location, after pressing the Browse button. 1. The name of the Minidump file: e.g. "062916-2080-01.dmp". At this example the "06" is the month, the "29" is the date and the "16" is the year of the dump file. 6. The Bug Check Code parameters. – At the LOWER pane, you will see a list of all the loaded drivers (or applications) when the BSOD error is occurred. In this list the most important details are highlighted and shows the driver (or the application) that cause the BSOD crash problem. e.g. "Ntfs.sys"
6. After viewing the BSOD Minidump file information, search the web for an available solution by typing the displayed "Bug Check String" in combination with the "Bug Check Code" or/and the module that causes the blue screen – crash – problem. e.g. search for "DRIVER_IRQL_NOT_LESS_OR_EQUAL Ntfs.sys" or "DRIVER_IRQL NOT LESS OR EQUAL 0x000000d1"
– Additionally: Right click at any line at the top pane and choose: "Google Search – Bug Check" or "Google Search – Bug Check+Driver" or "Google Search – Bug Check + Parameter1". 7. If you want to view the blue screen of death that displayed during system crash (BSOD), then navigate to BlueScreenView Options and select Blue Screen in XP Style. « Download Office 2016 Language Packs & Change Office 2016 Display Language	» How to Check Memory RAM for Problems with Windows Memory Diagnostic.